will be held in Augsburg, Germany. ... but we gave it plenty of thoughts: First, holding classes in other cities with all necessary seminar equipment requires a huge investment in time and energies in terms of travelling and also Roman is a much better teacher if he is not exhausted from travelling. In addition, we have a venue in Augsburg which is perfect in all teaching aspects and has a good (and cheap) hotel right next to it with a two minute walking distance. So, we think that we can host German and international guests in a proper way and ensure an ideal enviroment for learning, if you consider to travel to learn from Roman. Beside full weekend in depth seminars to a certain topic, Roman will also offer new class concepts, like one day classes with a specific topic. All seminars will be offered in German and English language. All seminars in Augsburg will take place as soon as we got up to three students! 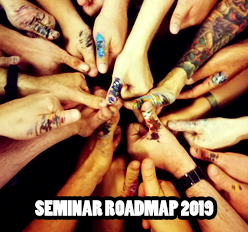 is in the making which might be interesting for some of you: Roman will hold a seminar for teachers and Miniature Painters that teach and want to learn more about the teaching aspect of this field to make their seminars an even greater experience for their students. If you are travelling far for one of these classes and want to spent some extra days with an even more in depth learning experience, you can also consider a private coaching session with one of your monkeys. Only available as long as time slots are available. Discounts on private coaching possible if you are booking a weekend class too. Speak with us! jarhead--at--massivevoodoo--dot--com. He will confirm your reservation as soon as possible (please wait at least 4-7 days) and provide any additonal information you might need. This MV class gives you insight into Roman's way of painting and basing, his thoughts, the background of his inspiration and a lot of fun and happy painting. This class aims at beginners and advanced painters, but also pros are welcome. More Information on MV's Jar's Beginners class? This is an in depth two day seminar that takes you deep into understanding many different materials, to analyze them and extract their properties into your painting work. Most important in this class are the questions: "Why?" and "How?". This seminar will help you step forward big time in your knowledge about painting in general and in small scale. Roman usually does not teach masterclass seminars, but when he does: These seminars focus on one subject, because they aim to teach you to master a certain topic. In this class it is all about speed, efficency and zombie hordes. Roman usually does not teach masterclass seminars, but when he does: These seminars focus on one subject, because they aim to teach you to master a certain topic. In this class it is all about light sources from objects and about the "how to" and "why" you can transport these into your projects. Roman usually does not teach masterclass seminars, but when he does: These seminars focus on one subject, because they aim to teach you to master a certain topic. In this class it is all about the glory of Space Marines. Roman will teach you to convert your own Primaris Marine and shows you all tricks on his disposal on creating epic heroes. Roman is planning on teaching at NOVA 2018 again. Information will be added when available. Anyway, looking forward to OSL and basing 👍. Will there be Airbrush courses again? That would be awesome. Good morning you lovely Gentlemen! I am qute interested in Roman's OSL and Space Marine Course. Preferably in German. Unfortunately both lack the PDF. Is this a mistake? Can we expect one soon? I'd beed to know the price, place and contents to make a decission. at the moment I wait for Roman to finish the texts for the PDFs :) So, the documents will follow, soon. The place will be the same as for all classes (have a look at the other PDFs). Perhaps I missed it, but which mini will we paint in the OSL workshop? Is the 24th November 3 Day beginner German or English? Its listed as both in the two different areas. German. Thanks for the hint, Jon! Hello, when do you plan to have a roadmap for 2019?